Everyone likes to own a good pair of earphones, whether they’re for listening to music and podcasts, playing games, or taking calls on the run. But not everyone wants to break the bank in search of the perfect pair of earbuds. The good news is that you don’t have to compromise the quality of sound when buying in a lower price range. After all, why choose between price and comfort when you can have both? We created a list of the best earbuds you can find for under $20, and there are different options and styles, so you’ll find something regardless of your usual preferences. Whether you like to keep it as minimalistic as possible or like to have a few additional features, such as a remote control and a built-in microphone, there are earphones under $20 that will suit all your needs. The type of earbuds you choose usually depends on your lifestyle. Maybe you are looking for something you can use on a daily base or something convenient for your exercises. There are numerous headphones that offer the best fit that won’t fall out even during the most rigorous workout regimens, and these are usually also waterproof and sweatproof. On the other hand, we also picked a few fashionable choices for people who want to fit their earbuds with their style, and two wireless options for added convenience. The comfort of your earbuds is just as important as the quality of sound, as we often wear earphones for extended periods of time. The in-ear headphones on this list are designed ergonomically, and most of them also come with various sizes of the ear tips, which is necessary to make sure they fit your ear perfectly. This is not only necessary for comfort, but a perfect fit also seals your ears, which isolates outside noise. Since cheap earbuds cannot compete with pricy options regarding sound quality, a decent amount of sound isolation will improve your listening experience exponentially. Also, be sure to look for the options that come with an enhanced bass feature if you like to enjoy powerful deep bass beats. The great thing about headphones is that they are simple, without a dozen special features. Although exceptional sound is a must for the biggest music geeks, most of us value simplicity and just want to plug them in to listen to our favorite playlist easily. Cheap earbuds are lightweight, and often come with long cords, some of which are designed to reduce the chance of tangling your wires. Many of the headphones on this list cost approximately $10, with several more expensive options with additional features, greater durability, and improved sound quality. The Panasonic RP-HJE120-PPK earbuds provide a perfect combination of low price and high durability. The ErgoFit design offers great comfort, while the three different sizes (small, medium, and large) will make sure these earphones fit perfectly in every ear. The cord is 3.6 feet long for added convenience, and it will easily fit even with the most active lifestyles. With the instant fit and the long cord, you won’t need to worry that the earphones will slip out ever again. And Panasonic didn’t think about comfort only; these buds are also fashionable. You can choose from nine color options, which come with a matched cord, so these will ramp up every style. The colors coordinate with the 5th generation of iPod nano. They are black, white, blue, orange, green, pink, red, silver, violet, and purple. The maximum input is 200 milliwatt, and wider frequency response will give you the most enjoyable listening experience. These earphones might not be our first choice when it comes to bass-powered songs, but the quality of the sound and sound isolation you can get for such a small price will leave you in awe. If the Panasonic earphones didn’t satisfy the bass enthusiast in you, then the Skullcandy Jib might do the job. These earbuds are also below $10 but come with enhanced bass, so you’ll be able to hear all the beats for a cheap buck. The noise-isolation will come in handy when you want to plug out of any noisy situation, whether you are walking through a crowd or want to mute the music they play in your gym. Two sizes of ear silicone covers are included so these earphones will fit almost every ear. Stay connected with your device out of the way with the lengthy 1.5-meter cord. The headphones and cord weight 3.6 ounces, and are compatible with a 3.5mm audio jack, which includes iPhone 6 and earlier versions, Google phones, and Samsung Galaxy. You can choose between eight different colors for the earbuds: black, blue, green, pink, purple, white, and yellow. These stylish TRONOE Earbuds come with comfortable ear tips in three sizes and are perfect for active people. They are made from Soft silicone, are sweat-proof, and provide excellent sound isolation. They come with three extra accessories, for various fit and uses, so you can choose which suits you best for listening to music, playing games, or exercising at the gym. Along with the attachments that keep them from falling out, there’s a clip for the cord, which you can attach easily to your clothes. They are also waterproof, which makes these earbuds a perfect choice for active people. The earbuds are magnetic so you can easily wear them around your neck when you’re not using them, and you’ll never have to worry about the cord getting tangled. These headphones come with a built-in mic and multifunction controls for adjusting volume, changing songs, and answering calls. The buds and cord weigh less than 3 ounces, and the cord is a convenient 3.9 feet long. The earphones offer great sound quality for the price and are compatible with a 3.5mm audio jack. The cord and the earbuds are color-matched, and you can choose between green, deep green, gold, and pink. With the MuvAcoustics Drive Wired Headphones, you’ll get the most out of both style and performance. The earbuds come in three sizes and offer a good amount of noise isolation. The rich sound will satisfy even the most demanding users, and it is enhanced with dynamic drivers for deep bass tones. Not only will the buds fit perfectly to your ear, but the flat cord will also minimize the chances of these getting tangled, so these are great for all daily activities. They come with an inline microphone and a remote control with volume and playback buttons to maximize the functionality of your headphones. The cord and earbuds come in three subtle color options: flagship blue, pure white, and steel black. The maximum input power of these headphones is 5mW, and they weigh 5.4 ounces with the cord. They come with a travel pouch for easy transport. And as the icing on the cake, if you’re not completely satisfied with these headphones, you can make use of the 30-day money back guarantee, and the 1-year warranty shows how certain the designers are of their durability. The lightweight Tintec In-Ear Headphones offer an exceptional listening experience with enhanced bass and treble quality. This is due to an exceptional earbud design made from eight different layers: back sound cavity, phonate component, shockproof membrane, front sound cavity, dust gauze, and silicone earcup. You can choose between three sizes of the soft silicone ear tips. These headphones have a contemporary design, and you can get them in three stylish and minimalistic versions: black, gold, and white. The inline controller has volume and multifunction buttons you can use to change songs, answer calls, or activate voice assistance or Siri. They are compatible with all devices that have a 3.5mm headphone socket. The frequency response is 20-20000Hz, like in all the headphones above, and the tangle-free cord is 1.2m long. Tintec also offers a two-year warranty and free technical support service. They take the quality of their headphones seriously, so all the products they make are guaranteed to perform. The VddSmm company puts a lot of effort into their production and testing procedures to provide the best design and quality, and all that for an affordable price. The housing of the earbuds is made of aluminum, which allows them to be both lightweight and have awesome sealing performance. It comes with a built-in microphone and control buttons with volume, playback, and handsfree calling options. The packaging includes earphones, three sets of different-sized ear tips, a convenient storage bag, and a clip for the cord. These in-ear headphones come with a 3.5 mm gold-plated headphone jack. The cord is 3.9 feet long, and the maximum power is 5MW. The earbuds weigh 0.48 ounces. With the 12-month warranty, you’ll be able to exchange your headphones if they are not functional or get a refund if these earphones don’t suit you at all. Compared to the other earphones in this price range, the GRTF Earbuds have an exceptional sensitivity response, which offers balanced and high-quality sound. The upgraded sound system features a thin shock-proof bass membrane and a soft electroacoustic conversion device, both of which improve sound quality. Also, the noise-reducing mesh, full tone Melodius, provides outstanding sound isolation, even when the volume is low. The ergonomic design of the earbuds make them very comfortable, and they will fit nearly every ear. They are soft and pain-free, and won’t fall out during your activities, so they will be very practical when you go for a run. These headphones have a built-in mic and in-line remote control with play/pause, handsfree calling, and next/previous song functions. You can choose between black and gray for your color. These headphones weigh 1.76 ounces, and are compatible with all 3.5mm audio jack devices. They come with a practical, protective EVA carrying bag that will minimize the chance of tangled wires and keep them clean when you are not using them. The Actionpie Headphones are a bit more pricey than the earphones above, but these few extra bucks pay off because they offer exceptional sound quality. The driver design will do an amazing job in playing all different tones, from the deep bass to the mids and highs. The exceptional sensing technology will put an end to high-frequency glitches. The silicone ear tips come in three sizes and offer exceptional noise reduction. Both the earbuds and the cord come in a classy gold color, and they also have a built-in mic so you can answer your calls easily. The frequency response of these headphones is 20Hz -24000Hz and the maximum power is 20mW, both of which are higher than all the headphones above. These headphones come with a lightweight pouch and a fashionable case, so you can choose which one suits you more on different occasions. The Acode headphones are a perfect choice for anyone who wants to get the most out of style and quality for less than $10. The bass-driven stereo sound offers decent listening experience, and the built-in mic and remote with play/pause, skip songs, answer/reject/end calls options also make them practical. The remote also features an “NK-IP” button for the best fit to every phone. The “NK” option is compatible with the N circuit (Nokia, Lenovo,etc. ), while IP is compatible with the S circuit (iPhone, HTC, Samsung, etc.). The Acode Headphones come in black, gold, silver, and rose gold. The noise isolating earbuds are made of comfortable soft silicone and come with small, medium, and large sizes of ear tips. A great addition to these headphones is the magnetic function. You can attach the earphones together to store them easily and avoid tangled cords. They are compatible with all 3.5mm jack devices, and weigh just below an ounce. Skullcandy’s designers are some of today’s most renowned artists, and the professional technical team is responsible for the state-of-the-art technology that delivers the highest quality of sound. The Skullcandy Ink’d 2.0. Earbuds are a bit pricier than the other Skullcandy headphones we mentioned above, as they offer improved sound. These earbuds feature Supreme Sound technology, which you will notice in the powerful bass and clear highs. Other headphones commonly fail to deliver realistic and smooth vocals, as they usually sound more like they come out of an AM radio. But the Skullcandy Ink’d 2.0 Earbuds produce natural, warm vocals as the final element of the best listening experience you can get in this price range. As Skullcandy’s targeted audience is the outdoor adrenaline sports demographic, they chose unique flat cables that reduce the chance of tangled wires and are also extremely durable. They also come with a simple remote with multiple functions to take calls, play/pause, or skip songs, and a clear-sounding built-in microphone. The headphones and the cord weigh 8 ounces. The earbuds are marked with a recognizable Skullcandy logo and come in seven different color options: black, gray, pink, blue, red, white, and a reggae-inspired color combination. The ear tips come in two sizes for an easy fit, which improves noise isolation. These earphones are a perfect choice for the people who like to get the most sound quality for a great price. The Marsno M1 Headphones are designed with quality dynamic drivers for enhanced bass and balanced highs. They are made with a sound isolating material, which provides passive noise reduction and prevents sound leakage. These earbuds are more durable than other earphones, thanks to a corrosion-resistant aluminum alloy housing. The cord is inserted with an oxygen-free copper wire which results in a longer-lasting cable. The one-button remote comes with multiple functions, including volume, play/pause, skip song, and answer call options. The built-in microphone is made to reduce the outside noise as much as possible. These headphones are also very stylish and come in black, gray, gold, and metallic blue. These headphones have a 3.5mm plug and weigh 3.5 ounces. Marsno offers a worry-free lifetime warranty for their headphones so you can get a full refund or replacement any time they fail for production reasons. 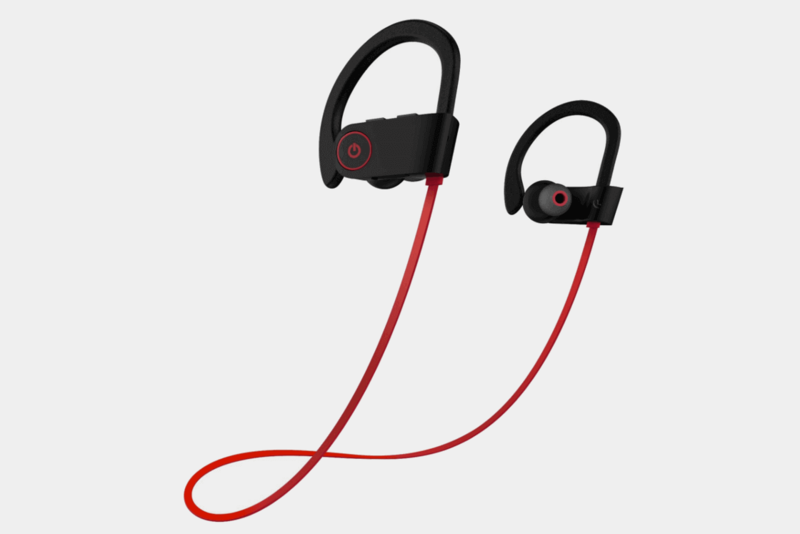 These modern and sporty earbuds are a very popular choice when it comes to headphones below $20, and they upgraded and improved their design in 2018. The newest upgrade features volume and previous/next song controls and a high-quality built-in microphone for clear talking. The microphone works on both Android and iOS devices. The full metal housing makes these headphones lightweight and decently durable, and the stereo deep bass sound will provide an awesome listening experience. The earbuds are comfortable even for small ears, and the custom ear tip sizes make sure they’ll never fall out. The maximum power is 5MW, and the plug is 3.5mm jack compatible. The cord is 3.9 feet long. These earbuds have a one-year risk-free warranty and come with a stylish black case. You can also call customer service if you encounter any issues with the headphones. In most cases, they’ll be happy to send you a replacement. These stylish earphones were designed specifically for active people so that they will be perfect for any activity, including jogging, exercising at the gym, hiking, and playing sports. Despite the intensity of your workout, the high-quality headset makes sure these stay in. Also, forget tangled wires because these earbuds are wireless, with Bluetooth V4.1+EDR for stable signal transmission and a superb sound. The battery will last for eight hours of active use and can be quickly recharged. You can check the battery status easily on the connected mobile device. They can be paired with two different devices simultaneously and have a 30ft range in open spaces. The play/skip/pause buttons on the earbuds are very convenient and simple to use. You can choose between two different sizes of included ear tips for the most comfortable and pain-free fit. The headphones weigh 0.64 ounces and require lithium-ion batteries. If you are not completely happy with your earphones, you can return them with no questions asked within 30 days, and they also come with a one-year warranty. The GGMM In-Ear Headphones are great for people who like to keep things simple. The earpieces come in two subtle colors, but other than that, they’re very minimalistic. You can choose between the three sizes of ear tips included with the headphones. The earbuds are tilted 20 degrees in-ear, which provides a natural fit, and they also offer a fair amount of noise reduction. GMM chose aircraft-grade aluminum for the earbud housings, which makes them both lightweight and durable. The titanium diaphragm speakers offer clean and well-balanced sound. The Built-in mic and simple remote control make it easy to answer and end calls, control songs, and call out Siri or any other virtual assistant. They have a practical “L” shape 3.5mm nickel plated audio jack and are compatible with most devices. They come with a simple travel pouch for easy transport. The newest upgrades feature deeper and richer bass tones and improved overall sound quality. The frequency response of these headphones is 20Hz-20KHz, and they weigh 2.4 ounces. The warranty lasts for 24 months, and you can reach customer service 24/7. These rubber headphones from JVC are another great choice for exercise enthusiasts, as they have a simple, lightweight design and are sweat-proof. The unique design of the earbuds provides great comfort, and the two different sizes of the “nozzle fit” silicone earpieces make sure these will fit securely in every ear. They are great for people who dislike the shape of regular earbuds. Because the design is different from usual in-ear headphones, though, you might need to use them a few times before you get used to the fit. This occasional beginning discomfort will pay off because you’ll never have to worry that they’ll fall out during your run, hike, or any other activity. The cord is 3.3 feet long with a 3.5mm compatible plug. The earbuds and the cord come in four color options, including black/red, white/orange, blue/black, and pink/turquoise combinations. Also, these headphones are one of the lightest on this list, weighing only 1.6 ounces with the cord. The UROPHYLLA earphones offer a clear stereo sound for a low price. The design of the earbuds offers an awesome noise-canceling feature, even when you listen to your music with low volume. They are made from silicone gel and come in small, medium, and large sizes. These will be a great choice for you if you prefer longer cords. The cable is 4 feet long, which makes it the longest on this list. You can also enjoy hands-free calling with the built-in microphone, and the remote-control offers answer/end calls, volume control, and skip track options. They are compatible with a 3.5 mm audio jack. The UROPHYLLA headphones come with a lifetime warranty, and you can discuss any issue with the customer service reps at any time. The Rovking Over-Ear In-Ear Headphones were designed to stay in the ear and don’t fall out even during the most intense exercise routines. They are conveniently lightweight and sweatproof. They are much smaller than the majority of regular earbuds, so if you have smaller ears than average and other earbuds usually fall out of your ears, or if you have ear pain after longer use, this will be an extremely convenient option for you. They also come with four different sizes of ear tips, so Rovking took put a lot of effort into making sure they will fit every ear. As the earbuds completely seal in your ear, you will get the most out of the deep bass sounds and noise isolation feature. The over the ear loops and ergonomically shaped earbuds will make sure they don’t fall out during your exercise, so you won’t have to adjust them regularly during your activities. The ear-hook wire has an ear shape memory and is flexible enough to adjust to different ear shapes easily. You can answer your calls and control your songs with an inline remote, and these headphones also come with a built-in microphone. The cord is approximately 4 feet long and has a 3.5mm audio plug. If you have any issues with these headphones, you’ll get a total refund or replacement at zero cost and with no questions asked. These headphones are another great choice for those who like to go wireless. The Kissral Earbuds are designed ergonomically and will fit nearly every ear. This makes sure they won’t cause ear swelling or pain. They are small and comfortable even when worn for long periods and weigh only 3.5g. Their upgraded design features a control button you can use to switch to the next song or hit pause easily. The 65mAh lithium battery can last for eight hours of speaking time and six hours of music time. They will last for a whopping 120 hours when on standby. You can charge them easily, and the charging time is only one and a half hours. You can check the battery status on the screen of the paired device at any time. The CVC 6.0 noise reduction and a built-in mic will allow you to enjoy high-quality calls. The latest Bluetooth 4.1 audio decode technology allows for high-quality connections and clear sound. The transmission distance is 30 feet, and ion-lithium batteries are required. You can pair these headphones with two different devices at the same time, and they are compatible with both Android and IOS devices. AmazonBasics offers many different everyday objects, from home necessities to electronics. They always try to provide the best possible quality for a good price, and their earphones are no exception. The AmazonBasics In-Ear Headphones have the most minimalistic design from all the earphones on this list. You can, however, spice things up with the five different color choices of the headphones and the cord, including classic black and white, fun green, pink, and red. The earbuds feature a curved, comfortable in-ear design that will securely fit your ear, and won’t cause any pain if you wear them for extended periods. The flexible 3.6-foot cable threads easily through clothes or a backpack and comes with a gold-plated 3.5mm jack. The built-in mic and a simple controller will make it easier to answer calls and pause or change songs without having to reach for your device. The headphones weigh just below 0.5 ounces. The maximum input is 10 mW, and the frequency range is 20Hz-20KHz. Amazon offers a one-year worry-free warranty if you encounter any problems with these headphones. The stylish Wieppo Metal Stereo Earbuds provide the same quality as many earphones in a much higher price range. The earphones feature 10mm-dynamic drivers for powerful bass and balanced highs, and the earbuds are constructed for accurate and enjoyable music reproduction. The metallic cavity creates natural sound while the air intake vent enhances bass tones. The ergonomically designed earbuds deflect at a 45-degree angle, which fits most comfortably in your ears, and makes sure they will stay in during every activity. You can choose between three sizes of the included soft silicone rubber ear tips, and the perfect fit will silence the outside noise. The simple one-button control features previous/next track and play/pause functions, and you can easily answer your calls with a built-in mic compatible with both Android and iOS devices. The cable is the longest of all the headphones on this list with its five-foot length and is made from thermoplastic elastomer for added durability. The oxygen-free copper wires provide the most profound sound quality. You can choose between a classy gold or a contemporary gray design. The Wieppo earbuds also come with a useful carrying pouch. They are covered by a 30-day money back guarantee and a one-year warranty. If you have any problems, you can reach the dedicated customer service department 24/7 through an email.